Review Oté Clean (Crystal Cleaner replacement) Easy product to use with excellent results. Review Oté Clean (Crystal Cleaner replacement) As recommended by my optometrist this is by far the best daily cleaner that I have used. Review Oté Clean (Crystal Cleaner replacement) Easy to use. One bottle lasts a long time. Review Oté Clean (Crystal Cleaner replacement) This is a great product, the only thing that should be used for cleaning Scleral lenses. Review Oté Clean (Crystal Cleaner replacement) This works well as a cleaner, and I find it useful because my eyes are sensitive and many cleaners sting. This doesn't cause that problem. Review Oté Clean (Crystal Cleaner replacement) An excellent product that is recommended by many ophthalmologists and optometrists. Excellent at removing proteins without the need for soaking and suitable with hard and soft lens so very convenient. Problems with the bottle cap seem to have been rectified allowing the bottle to be safely and hygienically sealed and transported. Review Oté Clean (Crystal Cleaner replacement) I have been using Ote clean for 12 months and can't fault it. Review Oté Clean (Crystal Cleaner replacement) Na excelente product that leaves my lenses clean, I tend to use it in conjunction with my normal cleaner as an extra cleaner. 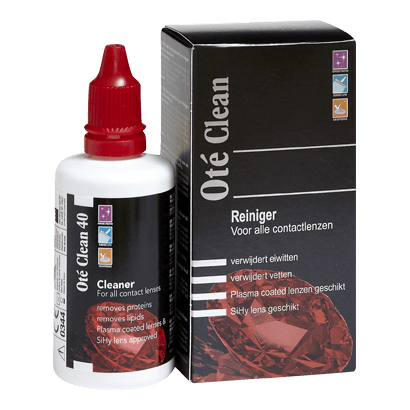 Review Oté Clean (Crystal Cleaner replacement) As I have sensitive eyes and use to using Miroflow ckeaner I was sceptical that this replacement cleaner woukd work. To my surprise it cleaned my scleral lenses wuth out keaving a haze and my eyes we comfortabke. Review Oté Clean (Crystal Cleaner replacement) I have used this product throughout its many name changes for the past 20 plus years after I developed an allergy to various other cleaners. I recommend it for hard lenses and especially if other cleaners do not suit your eyes. Review Oté Clean (Crystal Cleaner replacement) Very effective contact lens cleaner - one of the best I have used. Oté Clean (Crystal Cleaner replacement) Great, improved version! Love it! Oté Clean (Crystal Cleaner replacement) I have used Crystal Cleaner before and was a little bit disappointed when they replaced it. But I really like the new product. I was skeptical to whether Crystal Cleaner could be improved, but they proved me wrong. Awesome product! Produced by Oté Pharma Sol, this cleaning solution is a simple and popular way to remove dirt and debris from common lenses. You might have come across this market leading lens cleaner under the name "Crystal Cleaner". The superb formula has not changed, so if you've previously used Crystal Cleaner you can buy with confidence. Oté Clean uses a safe chemical formula which includes ordinary alcohol and non-ionic compounds. These compounds react with dirt from proteins or fats, as well as dust which accumulates on contact lenses, working to remove them completely. Aided by the preservative Polyhexanide Biguanide, this leaves your lenses fresh and ready to use every morning, ensuring sharp and clear vision. It's important to ensure your lenses are always completely ready for use, so it makes sense to go with a cleaning product that is tried and tested. With years of popularity and a highly effective formula, Oté Clean is just such a product.